From Locas II by Jaime Hernandez, Fantagraphics Books. I could go on in really revealing and embarrassing ways about how much I love Love and Rockets. Wait, I think I already have. Lately, I’ve been re-reading the Locas series which can be found in two humongous anthologies recently re-issued. I’m almost done with Locas II and I’m reminded as to how influential the comics were in my early life. Quite honestly, I can’t even say they were influential as they felt much more documentary, as in my life often seemed to be reflected in the stories to the point where I wasn’t even shocked when I’d read almost word for word conversations I’d have in real life being said by the characters in the book. Re-reading the books now is almost like a source of comfort, the kinda life I have is so rarely reflected in the media spectacle that there is something to seeing one’s own experiences, including insecurities, being expressed by characters who have some commonalities. Commonalities…! They are CHICANA PUNKS FROM SOUTHERN CALIFORNIA, who lived in-between cultures, were superstitious, fell in love hopelessly (even with cholos), had crazy drunken street adventures, doubted themselves (for all the above reasons) and still managed to try and stay punk even when they weren’t anymore! I have way more commonalities with these things than I should publicly admit on this blog. See, I told you I couldn’t help but going on. 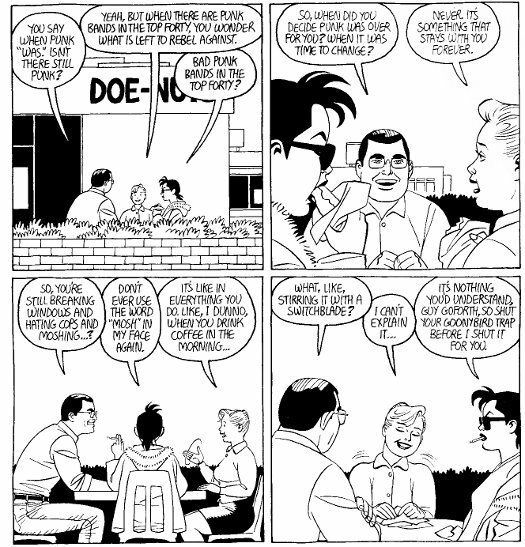 Thank you Jaime Hernandez for bringing out the beauty of our everyday lives! I met the Hernandez Bros. once at Golden Apple quite some time ago and tried to tell them in my gushing way some of what I just wrote. They answered “Yeah, it’s cause we peek in your window at night.” And at the time I sorta felt like they were mocking me which left me a bit confused. Also because Gilbert told me with what almost seemed like sarcasm that he was married to “a gringa.” And I remember thinking “What does that matter?” Maybe now, I would’ve understood what was happening but at the time, I was a too-cool-for-school twenty year old who thought she was meeting some kind of heroes and was sad to find, well, they weren’t. It was a very good lesson for me and later, helped me appreciate their work even more. 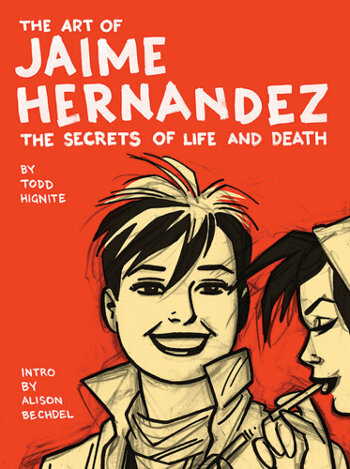 The Art of Jaime Hernandez by Todd Hignite just came out last year and it’s a gorgeous book filled with color strips, drawings, punk flyers (Nardcore!) and photos of Jaime and his brothers. The text is a bit hard-to-read and I wish there would have been more of Jaime’s direct quotes in the book but the book is, afterall, focused on Jaime’s personal drawing style which is universally recognized for it’s innovativeness and originality. Another great book to read in 2011! I read the Locas trade books in late ’09 and early ’10 thanks to Sean who gave them to me for Christmas. I loved them and was almost sad I hadn’t discovered them earlier. Have you gotten around to reading the new stories? The third volume has one of the best stories I’ve read from Jaime. If you want to borrow them, let me know. Not much of a market for Chicano punk comics, but I always appreciated that they did those storie. Los Bros Hernandez have been my soap opera since I was a 15 year old heura punk girl growing up in the same neighborhoods as Maggie and Hopey, with the same friends … 25 years later, I still love these stories, and this art, and I still stir my coffee the same way. Hey all, thanks for the comments! @Dana, I like the way you call it your soap opera cause I imagine, the Hernandez Bros were influenced by the small Mexican fotonovelas that are popular reading material. Oh, and now every time I see someone stirring their coffee, I’m gonna be like, that’s so punk rock! 😉 Thanks for sharing your story, “huera”! It’s much appreciated! I picked up my first issue because of the title, because it had been copied by the post-Bauhaus band. It was better than the band. What really did it for me, aside from the story and scenery was that self-doubt. It was drawn so well like in that sample you posted. I had to look it up – angst. L&R had the see saw of apprehension, hope, and action in an everyday context. Donut shop angst. Minority angst. Female angst. Angst just the moment before going all “diy”. We don’t even have a word for it, so we have to borrow it from German. I had this L&R t-shirt, and when I wore it, strangers would come up and talk. The comic book was pretty popular in Berkeley. They’d say it was the only comic they’d read, and someone turned them on to it, etc. The shirt was like an invitation for people to have confidence.